Image Comics announces WINNEBAGO GRAVEYARD by Steve Niles and Alison Sampson will be sent back to print in order to keep up with the increasing level of customer demand. The second printing will feature a wrap-around cover with artwork by Katie Skelly. 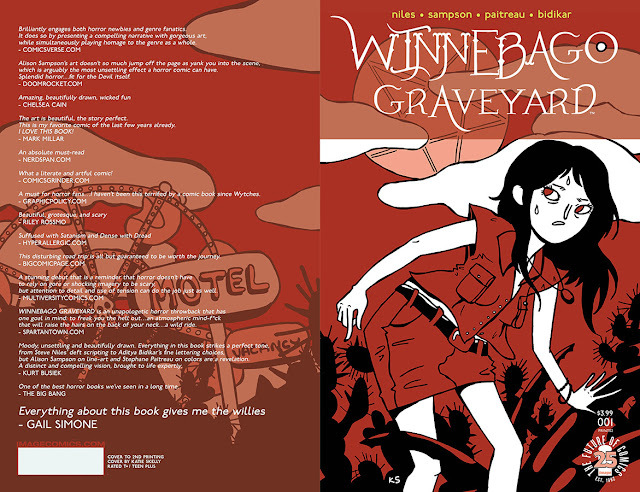 In WINNEBAGO GRAVEYARD, an American family traveling on vacation finds themselves stranded in a small town with a sinister secret. The series promises to take readers on a plot-twisting road trip filled with mystery and intrigue as they encounter creepy fairgrounds, nefarious characters, seedy conspiracies, towns full of Satanists, and a teenager. What else could possibly go wrong?